This manuscript contains several works, including a collection of recipes, charms, and surgical operations by John of Arderne; a series of drawings of medicinal plants; and a Middle English translation of a Latin medical treatise. John of Arderne (1307-1376) was the first English surgeon to achieve national and international fame. He attended English troops at various battles in the Hundred Years War, which gave him the exceptional opportunities to treat injuries and to study corpses anatomically. 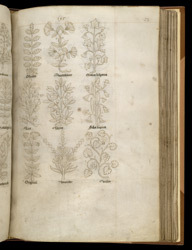 Some of the plants depicted here are not common, and their Latin names are not familiar to most people today, but the lowest row of plant drawings on this page contains three well-known plants: oregano, lavender, and violet.